As the summer months begin to fade, the brisk fall weather means more time for seniors to cozy up in the comfort of their home. While falls may not seem like an overwhelming source of danger, the reality is that each year, one in three adults age 65 or older will unintentionally fall, making fall prevention a priority. According to the Center for Disease Control and Prevention, one in three adults age 65 or older will unintentionally fall and an older adult will be treated in emergency rooms for fall injuries every 11 seconds. Falls are also the most preventable reason for a visit to the ER. This means that fall prevention must be a priority for those seniors choosing to age in-place, their family and caregivers. 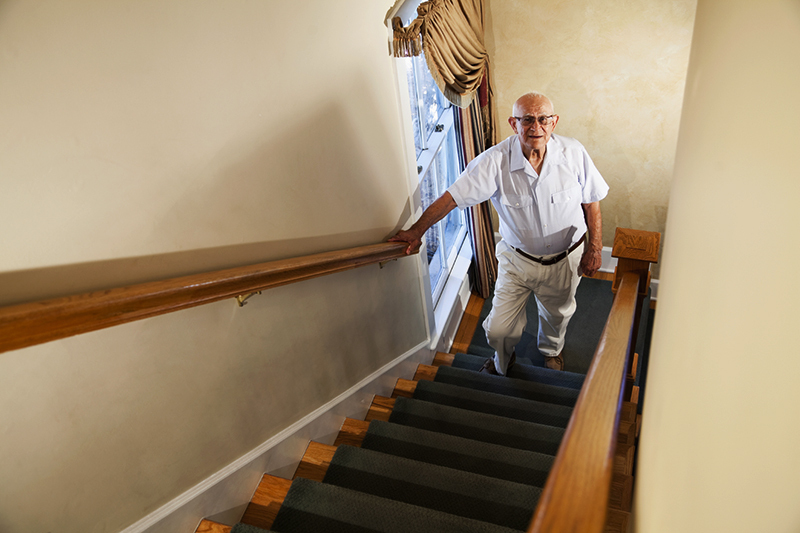 Falls can be avoided, and with the help of these four tips, seniors aging in-place can maintain a safe, comfortable, and independent lifestyle while reducing the risk of falling. Many falls are linked to balance, muscle weakness, reflexes and sensory problems. Thankfully, most of these skills can be trained and strengthened with fall-prevention specific exercise programs. The exercises range from as simple as balancing exercises that can be done in the comfort of a senior’s own home to more professionally taught programs through a trainer or class. No matter where or who they are exercising with, aging adults should focus on exercises that promote the ability to keep a low center of gravity, as this is crucial to building an overall better sense of balance. Senior’s with existing medical conditions should consult their doctor or physician before beginning any exercise program to make sure they are not putting themselves at harm. Even two days a week will do wonders in improving senior’s overall health and balance for fall prevention. Individuals suffering from vision issues are actually twice as likely to fall compared to average seniors. This is because those vision issues can affect balance, mobility and upper and lower body strength. Seniors aging in-place should make sure to schedule at least one vision appointment every year for a proper check-up, and should not hesitate to contact their doctor should they experience any changes in their vision. Dizziness, lightheadedness, and drowsiness are just a few of the common side effects for both prescription and non-prescription medications that may increase fall risk. Seniors taking medications—especially those taking multiple prescriptions—need to be aware of the potential side effects and take steps to reduce them for causing falls. Family and caregivers should also assist aging adults in managing their medications to ensure that prescribed amounts are being taken correctly and in a timely fashion. While it may provide warmth and comfort during the colder months, a senior’s home also presents numerous potential challenges and dangers for causing falls. There are many measures that can be taken to prevent environment-related falls. Home modifications like hand railings on stairs or in the bathroom and non-slip pads on all rugs and mats are some immediate ways to increase fall prevention measures. Also making sure everyday necessities are easily accessible and keeping floor clutter to a minimum will reduce the risk of falling for seniors aging in-home this fall and winter. For more tips, read our 7 safety tips for reducing fall risks. If you haven’t had a home inspection in the last few years, our CAPS (Certified Aging-in-Place Specialist) Builder provides a thorough evaluation of an older adult’s living situation, including potential fall hazards the home might contain. For aging adults looking to prioritize fall prevention, and the peace of mind for relatives and loved ones, learn more about In-Home Care here, contact us on our website or call one of our aging-in-place specialists at 1-866-SENIOR-1.